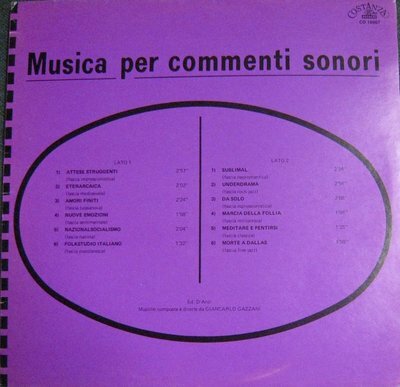 In the second half of 1974, composer-conductor Giancarlo Gazzani’s nine-track Musica per commenti sonori LP, with fellow composers Sandro Brugnolini and Stefano Torossi, was released and then immediately recalled by Costanza Records. 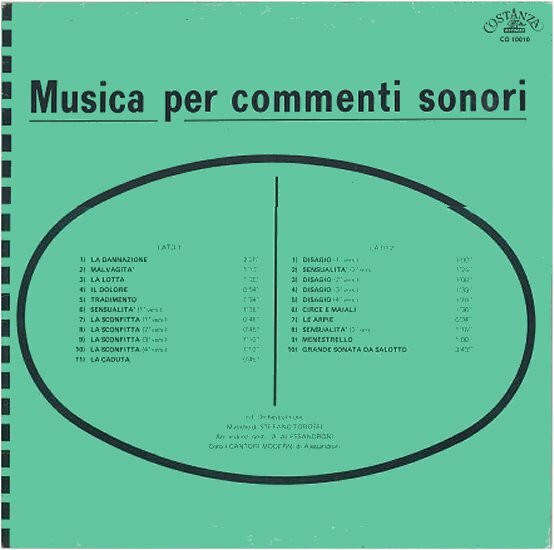 Of the original nine instrumental tracks on Costanza’s withdrawn 1974 Musica per commenti sonori album–which shared an identical catalog number and title with Stefano Torossi Musica per commenti sonori LP released in 1971, four have recently appeared for the first time since the aborted release 40 years ago. Giancarlo Gazzani’s original compositions, “Shift” and “Perifrasi,” also just leaked out four decades after being withdrawn from the record company. 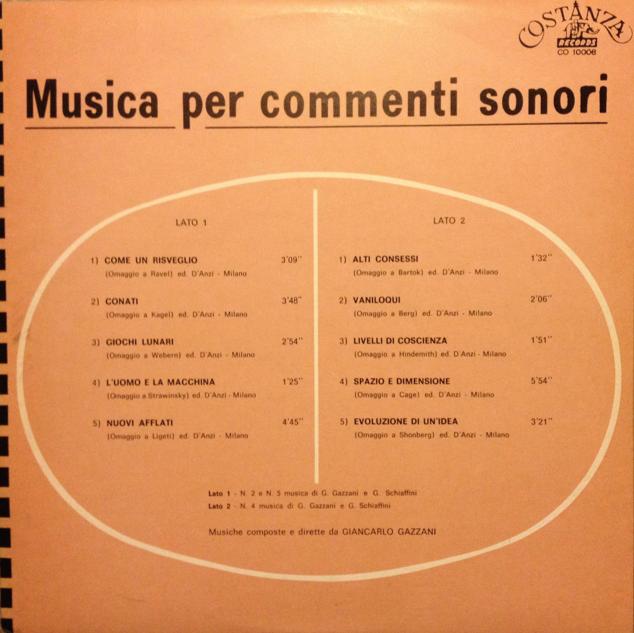 In 1973, Giancarlo Gazzani’s Musica per commenti sonori was released on vinyl by Costanza Records (CO 10008). Three of the ten tracks later turned up on the Fonit Cetra-Rai Trade Strumentali: Musica per strumenti acustici (1992) CD, worth looking for as it also includes six of eleven tracks from Gazzani’s 1971 Costanza LP (CO 10006) and nine of the ten tracks from a certain library music Holy Grail album examined closer below–“Fearing Much,” the missing track, was slipped onto Commenti musicali: Young Music Young Ideas (1993), a CD compilation by Fonit Cetra and Rai Trade which also has Giancarlo Gazzani’s composition “Eterarcaica.” Stefano Torossi is credited as producer for both the 1992 an 1993 CD releases. 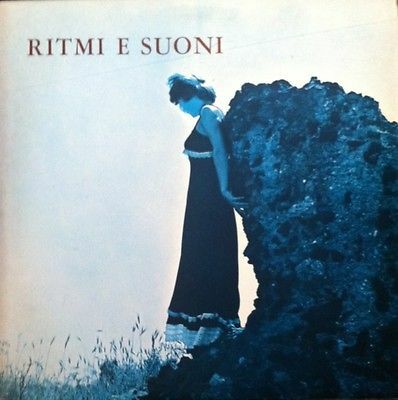 Another album released the same year, Rimi e suoni by Vasco Vassil Kojucharov on Italy’s Picci label, is said to also feature Sandro Brugnolini and Stefano Torossi. This is not certain, however, as neither Brugnolini nor Torossi is mentioned anywhere on the disc or record sleeve. In 1974, Giancarlo Gazzani, Sandro Brugnolini, and Stefano Torossi worked together on another album, Feelings, which also features a fourth composer, Puccio Roelens. The vinyl LP, CD, and now digital download is one of the most enduring and widely respected albums in the library music genre. First released on Italy’s iconic Carosello label, the album has been reissued by Brazilian label Top Tape in 1975, the UK’s Conroy Eurobeat in 1976, and by Italian labels Costanza Records, Fonit Cetra, and Easy Tempo between 1986 and 2000. In 2012, Portugal’s Golden Pavilion Records reissued the classic album in vinyl, while in 2016 Schema reissued it in vinyl and CD. 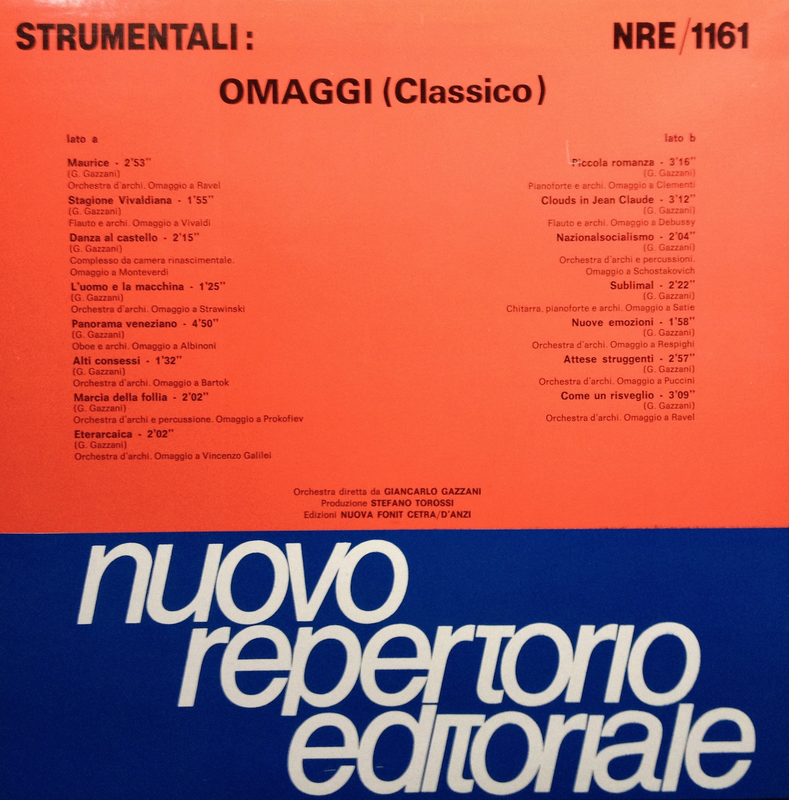 In 1988, Giancarlo Gazzani’s Strumentali: Omaggi (Classico) was released by Fonit Cetra, a 15-track album produced by Stefano Torossi that contains six tracks from Musica per commenti sonori (CO 10006) and a trio from Musica per commenti sonori (CO 10008). Born in Rome in 1941, Giancarlo Gazzani studied trombone and composition in school. He also began conducting, which later resulted in stints as head of various symphony orchestras and rhythm groups. Gazzani has done numerous original compositions, arrangements, and transcriptions for wind instruments and is currently the head of orchestral exercises at the Conservatory of Turin. Among non-musical activities the composer and arranger is known for are racing motorcycles, something Gazzani did professionally in his younger years, and being a licensed pilot, a pastime he continues to enjoy in 2014. Giancarlo Gazzani released another LP titled Musica per comment sonori for Costanza Records, CO 10007, that contains eleven tracks. 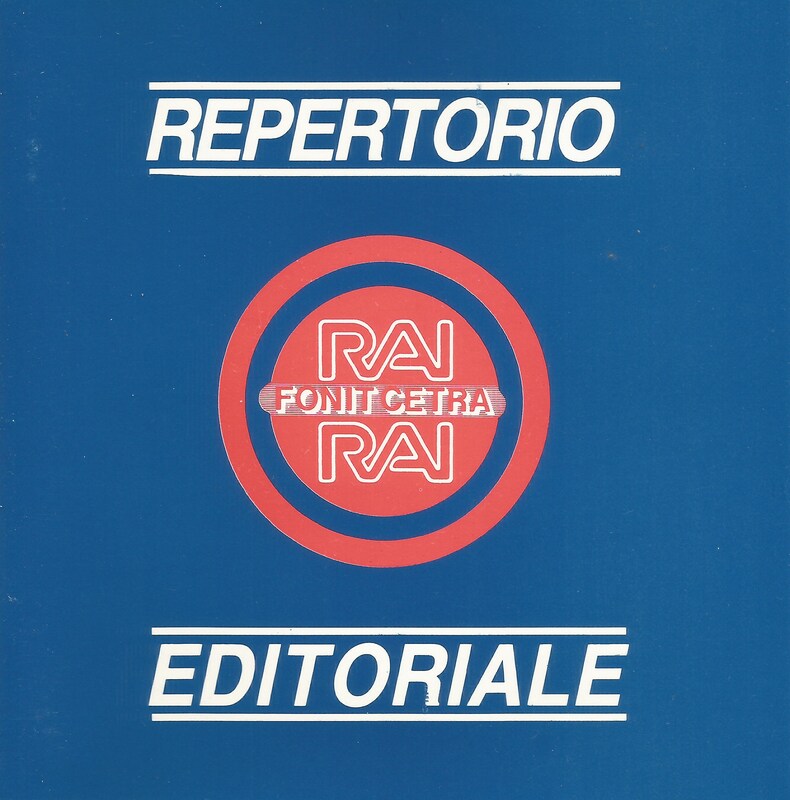 Six of them were reissued on the aforementioned Strumentali: Musica per strumenti acustici (1992) CD, produced by Stefano Torossi. 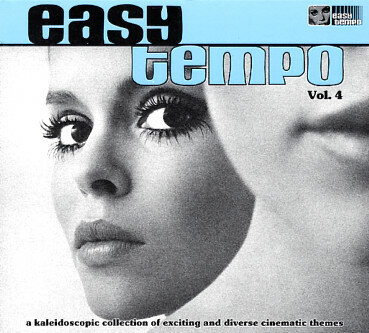 “Underdrama,” the eighth composition by Giancarlo Gazzani on Musica per comment sonori (CO 10007), is on the Easy Tempo Vol. 4: A Kaleidoscopic Collection Of Exciting And Diverse Cinematic Themes (1997) compilation album, reissued in CD by Easy Tempo in 2007. 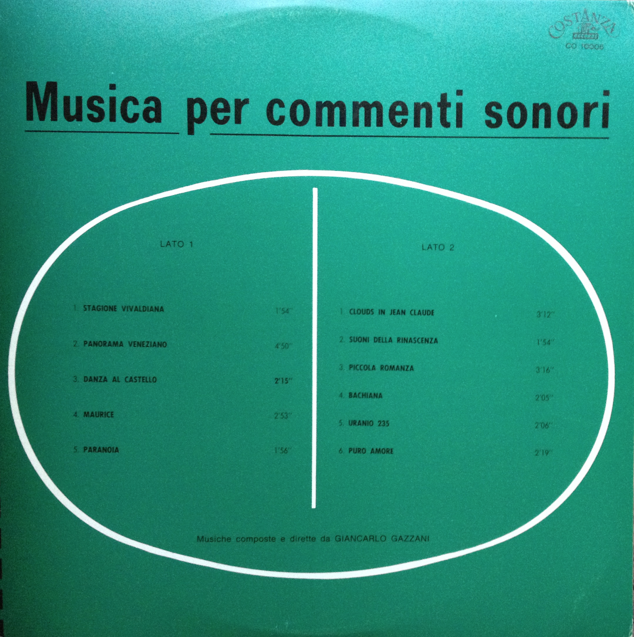 Besides the withdrawn Musica per commenti sonori LP in 1974, Giancarlo Gazzani appeared on a 45 single for CAM’s Seduzione coniugale soundtrack. “Colpa tua,” which is on the LP, is also included in Schema’s 2001 Metti una bossa a cena 2 compilation CD and LP, an excellent introduction to some of Italy’s finest artists that includes Stefano Torssi’s “Per lei (1 vers. )” and “Allora, il treno” by Bruno Nicolai, featuring Edda Dell’Orso, among other standout tracks. In addition to composing, conducting, and directing, Giancarlo Gazzani is a noted arranger. “Santana, A Portrait” by the Orchestre d’harmonie de la Flume, directed by Rémi Pasquet, and arranged by Giancarlo Gazzani, was recorded on 24 May 2014 at Festival Les Vents Dominants. Click HERE.